Sprint S8 / S8+ pre-order discussion. Starting a thread for my fellow sprint users preordering the s8 plus. I plan to order the black one as soon as sprint will let me. Hoping for a better experience than I had with the note 7. Happy to get back to Samsung after a short stint with the v20. Don't get me wrong the v20 is a solid device, but I miss my Samsung's. I ordered the black one at around 1 am. I saw that shipping date as well, but in my confirmation email it said 4-21 so I guess we'll see. Now it's time to figure out cases. Has anyone ordered the OtterBox defender? I'm glad to see it's actually available unlike for the note 7 where it became available right before the recalls hit. I had the Supcase Unicorn Beetle pro, which wasn't bad just a little thinner than I want for work. The price is right, at $15 though. Just read that email, mine says 4/21 as well. Not sure if you've owned any Spigen cases before, but they are great quality and look good too. 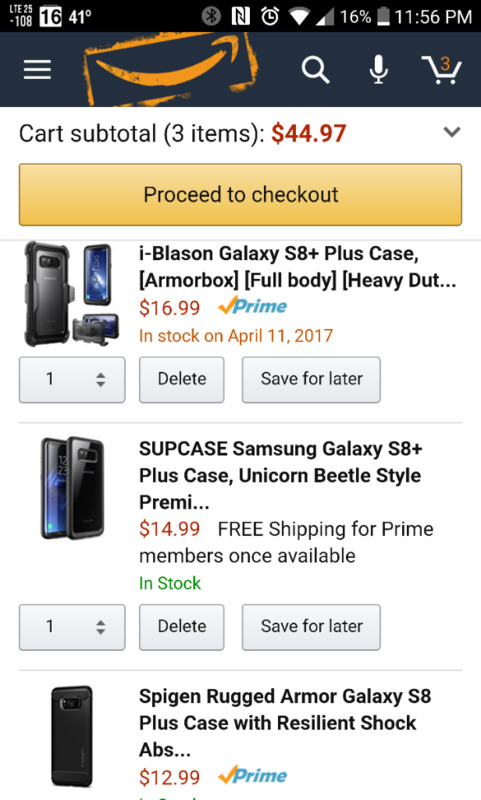 Pre-ordered with Sprint and just ordered the Spigen Ultra Hybrid S (the one with the kickstand). Will probably order a Seidio Surface case and holster as well. Wonder if the Spigen will fit the Seidio holster? Shipping starts on 04/17 so then it should be to you by 04/21. It made me pay $10 for next day shipping so of it ships 4-17 I better get it 4-18. I'm still holding out hope they ship earlier like the g6. Pre-ordered mine in black. Galaxy Forever promotion. Got this Ringke case when it was on sale for $4. Ordered the Spigen screen protectors. Yep, had one on the Note 7. Loved it. Before then I always had an Otterbox on my phones but it just seemed so bulky on the Note 7. That would have been a waste of $$. Sprint made me pay the $10 shipping charge as well. Ordered a S8 for the wife and a S8 plus for me. Had to pay 10.86 for shipping and taxes. Had the Note 2, Note 4, and using the Note 5 the past year. Ordered a silver S8 Plus on the 1st. Hoping I see it in time to grab the $99 deal on the headsets and SD card. I like how the Sprint pre-order thread is low-key and light whereas the T-Mobile one and others are full of complaints and bellyaching. Hope to have mine 2 weeks from today. Give or take. P.S. I love the Otterbox Symmetry series but $50?? Yikes!! Their galaxy forever deal got me. Can get the newest one every year. Going to miss the Note series though. VW Maverick, james702283 and LoveMyPhone like this. Ordered first hour and I got the black s8 plus. Can't wait. I've been refreshing the page everyday . It does say 21 of April for me. Sounds like they did an Unlimited Everything plan ($60 for the first line, $40 for the second), then applied a $10 loyalty credit per line. Sprint has the best price for any carrier hands down , I was a coustomer for 10 years and left a month ago paid in full on all , been trying for a week to transfer back with preorder for the S8+ even went to a corporate store with 2 ids and they couldn't even transfer me back what the heck man , so I'm beyond frustrated with Sprint , and holding out for the S8 unlocked from Samsung directly . Corporate America is just to much. I was thinking OtterBox defender, but can't justify the price. So I'm going with these 3 for slightly less than the OtterBox. Oooh. My AT&T order status has changed to preparing to ship! Whoops. Wrong thread. Never mind. If your port out on the account was less than 45 days ago you can have the account re-instated. It took me 2 hours on the phone, but I did it. For people who moved up to s8 from s7. Do you feel like it was worth the jump?